What is CEPEC and what would it be use it for? CEPEC is an acronym for the California Equestrian Park and Event Center - a non-profit California corporation formed to create a world class, equestrian sports complex for use by equestrians and the general public. Having CEPEC privately owned and managed will allow it remain functional and maintained even in difficult economic times. CEPEC will be used for recreation, education, entertainment, events, competitions, and historic artifacts and open space preservation. What events and facilities would be there? The CEPEC complex will provide facilities for a wide variety of horse events (shows, competitions, demonstrations, clinics) and disciplines (including dressage, stadium jumping, eventing, driving, cutting, reining, vaulting, barrel racing, and polo). Competitions will not be hosted for major events which already have facilities in Sonoma County (i.e., rodeos and major hunter-jumper shows). The complex will also be used for conferences and educational events such as classes, clinics, certification programs and job training. Historic artifacts that document and display Sonoma County's rich equine history will be preserved and on display in the CEPEC museum - which will also contain an equine library and displays of equine artists. the museum will also have local wildlife exhibits and information about habitat care. Bike riding is not planned for the trails because the risk to hikers and equestrians. CEPEC will have an equine quarantine center and a critical care veterinary center which will provide advanced medical services such as major surgeries and medical imaging. How much will CEPEC cost to build and who is paying for it? The construction is currently estimated to cost about $200 million dollars. Plans are to build the facility in stages as funds are obtained. Funding will be obtained from a variety of sources such as revenue (e.g., events, corporate sponsorships, retails sales, membership fees) , private donations, grants, trusts, and fund raising events. Unlike many major horse parks in the U.S., CEPEC will not rely on government funding, bonds, or taxes for its operations or management. How will CEPEC benefit Sonoma County's general public, equestrians, horse trainers, and boarding stables, and local show facilities? CEPEC will provide entertainment, recreation, educational opportunities, hiking trails, museum displays, employment, as well as revenue for the hospitality, tourism, and local business industries and tax revenues.CEPEC will offer equestrians a place to ride year-round in open and covered arenas, a central location for clinics and viewing equestrian events, a facility to obtain advanced level medical services, and a place to view Sonoma County's historical equine artifacts and memorabilia. The public will also benefit from the professional services CEPEC will offer such as meeting and convention venues. Trainers will be able to "haul in" to the CEPEC facilities year around for practice, conditioning, and training as well as bring their clients to horse shows. CEPEC's covered and open custom arenas will provide optimal footing and riding conditions for practice, conditioning, and showing in disciplines such as dressage, jumping, eventing, cutting, reining, barrel racing, driving, vaulting, and polo. Participants in horse shows at CEPEC will need local stables for short or long term boarding. Since CEPEC will not be a general boarding facility, it will rely on local stables to provide housing for horses that may arrive several days before an event at CEPEC, or who may be on a circuit requiring a lay over between shows at different West Coast locations. Owners and riders who bring horses to Sonoma County will be referred to local stables by CEPEC for accommodations and to local trainers for their services. Existing show facilities in the county will be an important resource for CEPEC to host shows unable to be accommodated by CEPEC. In addition, existing show facilities can be utilized to assist in qualifying riders for high level events hosted by CEPEC. Why was CEPEC chosen for its name? Where will it be and why was the location chosen? 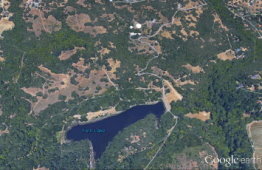 The Southern area of Sonoma County was chosen after several months of investigation and interviews. The original site for CEPEC was in the Roblar Valley but was eliminated due to excessive cost of threatened species mitigation and land. CEPEC has submitted a proposal to acquire a site in Sonoma Valley adjacent to Highway 12 near Glen Ellen. To qualify as a potential CEPEC site, a location must meet over thirty requirements for land, water quantity and quality, location, climate, zoning, terrain, distance from earthquake/fire/flood zones, etc. The original sites for CEPEC in South Petaluma were withdrawn from consideration due to excessive land and species mitigation costs. A site that meets the CEPEC land requirements became available in 2015 when the California State Legislature passed a bill to close the state owned 950 acre Sonoma Developmental Center in Sonoma Valley. 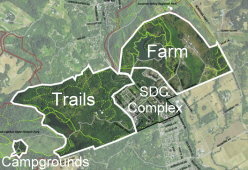 A proposal from CEPEC to acquire 720 acres surrounding the SDC core campus (see below) was submitted to the State in August 2015. The land on the west side of Arnold Drive and next to Jack London Park is planned for open space for trail riding, hiking, and wildlife preservation. The land between Hwy 12 and Arnold Drive is slated for the equestrian complex (e.g., riding arenas and courses, barns, vet center, museum, etc.). A wildlife corridor will be maintained along the north side of the properties. How will scheduling with other major county events be coordinated? Every effort will be made to schedule major CEPEC events to not conflict with major regional events in the vicinity (like NASCAR). Participants will be requested to arrive and exit the CEPEC facility at times that will minimize traffic. Since most shows at CEPEC will be hosted on the week-ends, the effect on commuter traffic should be minimal. However, event participants will be requested to arrive at and exit the CEPEC facility during non-computer hours. CEPEC plans to have a sufficient security system to ensure the security of facilities, horses, and equipment. This will include an on-site security department and camera monitoring system throughout the complex and riding trails. Security personnel will patrol the grounds on foot, in vehicles, and on horseback. Horses entering the complex will be required to provide proof of standard tests and vaccinations (e.g., negative coggins, influenza, EVH). Equestrians will be required to sign a General Agreement and Liability Release. How big will CEPEC be? A 1,000 acre complex would be ideal. The land designated for open space will include livestock grazing and trails for horse riding and hiking. The remaining land will be used for the equestrian complex and its infrastructure. Why can't Sonoma County's Fairgrounds be used? Neither County Fairgrounds are appropriate venues for CEPEC because: they do not offer space for large scale national or international horse shows or simultaneous, large multi-discipline events. 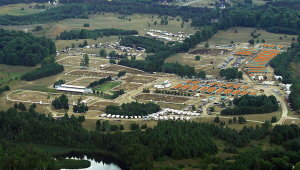 The Sonoma-Marin Fairgrounds does not host equine events. The types of events that can be held at the Sonoma County Fairgrounds are limited due to issues such as arena footing and limited number of arenas. Neither fairgrounds offers the infrastructure and space for education and conference centers, and medical/surgical and imaging centers. Additionally, the Sonoma County Fairgrounds is not interested in utilizing its facilities for training, conditioning, and housing of horses (including race and polo horses). The location of the Sonoma County Fairgrounds requires driving on Hwy 101 through Santa Rosa, which is often congested. The current site being considered will be more easily accessible from Sonoma, Marin, and Napa counties. How will CEPEC be maintained? CEPEC will be maintained by employees and volunteers. The maintenance staff will be recruited from individual applicants, local labor agencies, youth organizations (like Hanna boys Center, 4-H, and FFA), and farm organizations. Volunteers will be recruited from youth, senior, and local equestrian organizations. All employees will be required to have standard labor verification (e.g., age, ID card, proof of residency, work permit). The project was initiated in March 2009. Several activities have been accomplished including: market research; a business plan; specifications and cost estimates; letters of support from community businesses and sale interest from land owners; presentations to county agencies, service organizations, and clubs, local press, TV, and radio; web site; formation of an advisory team and Board of Directors; incorporation; obtaining seed development funding; studies of economic and environmental impacts; preliminary permit review by the Sonoma County Permit and Resource Department; federal 501c3 nonprofit status; initiation of capital fund raising campaign; a master Plan, initiation of land acquisition negotiations, and the recent proposal to acquire a site in Sonoma Valley. Click here to view CEPEC's activity Highlights. What are the next immediate steps? Fund raising for land, design, permitting, and an environmental impact report. Web site designed by Wanda Smith and last modified on:2/18/19.